This is one of my favorite brushes. Lasts a long time and has nice control. This and the Nylox series are fantastic all-around brush. They're very solvent resistant, so they can survive many cleanings and last for years if maintained properly. Definitely don't be an idiot like me and lose the cardboard brush covers, because without them, you'll be hard pressed to preserve their shape over time without making your own like I did. I have yet to run across a better brush for cut-in work. That said, Purdy are aware they make a good product and charge quite a bit more than the mid-range brushes. Still, any serious painter knows that only a high-quality brush will do. I like this brush for cutting in door casing and trim. I own a few Prudys and when I do have to paint they seem to make me look good. Purdy makes the best. 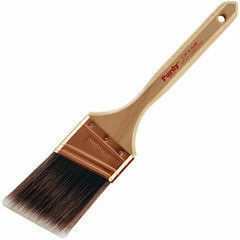 Long lasting, holds paint well, lots of control with the tip, cleans up well for good service through many projects. And when I am done with it as a painter it makes a great dust brush. This 2.5" angled tip with the XL -Glide bristles is my favorite size & shape. The most versatile. The only brushes I use are Purdy ... unless I'm using throw-aways. Always gives great coverage the first time. The Purdy brushes are the best I've used for over 20 years (but, I'm an amateur). :whistling Corona was good too, but haven't used them in a while. But for good paint absorbtion, the right combination of stiffness and flexibility, and secure/straight bristles you can't beat a Purdy! This is the best brush I have ever owned. It still cuts a great line after years.